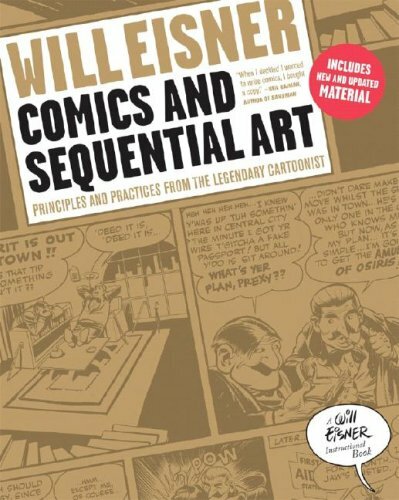 This is one of the three instructional books written by Will Eisner. The other two are Graphic Storytelling and Visual Narrative and Expressive Anatomy for Comics and Narrative. The book focuses on the creation of comics and the various techniques one can use. Specifically, it talks about the why the techniques work and the concepts behind. The various lessons touch on timing, framing, composition, expressive anatomy, writing for comics and other application of comics. Every page of comics included that serve as examples come with captions. They explain the effect to achieve on readers. One example would be to tilt a composition of a moving train to simulate the rocking on the tracks. How Will Eisner uses his panels and framing is amazing. He can use doorways or windows on a plane as frames, and he can so easily blend his panels together using the environment. Paneling and pacing when done right really just enhances the story. You'll see and understand why it works. It's all explained. This book will serve as a very good introduction to comic artists. Professionals might learn some new ways of doing things too.